It’s unfortunate that I was too busy and stressed during most of pregnancy and the early months of having a baby to blog over here, as I had a lot of fun finding new ways to nourish myself with all the crazy changes going on in my body (can you say NUTRITION NERD?) and I didn’t have the chance to document them. So while this site won’t turn into recipes exclusively targeting moms and moms-to-be, I will occasionally be posting some of the recipes that helped me through the tumult of becoming a mother. And even if you don’t have a need for the kind of nutrient-dense, filling and one-handed snacks that breastfeeding moms do, you may have a loved one with a baby on the way, or a hungry teenager in your life, or you’ve started a new workout routine that demands some portable and satisfying snacks. In which case, you can’t go wrong with a batch of any or all of these snacks. Freeze them on a sheet pan, transfer them to a labeled freezer bag, and gift them or store them in your freezer for easy grab-and-go snacks for any time of day. Or night. Like, middle of the night with a crying baby in your arms. They are lifesavers. Heidi Swanson’s Oatcakes (via Sweet Amandine): In the dark beginnings of breastfeeding, I would wake up for a 3AM feeding absolutely ravenous, exhausted and despondent about the day ahead. Then I would reheat one of these not-quite-muffins and sit down to feed the baby while breaking off dense chunks of oat-y, nutty goodness with one hand — and feel suddenly okay about being awake at such a godforsaken hour. Full of healthy omega-3 fats from flax seeds and walnuts, and fragrant with the combination of maple and coconut oil, these kept me satiated and happy for months. I made and froze two dozen while I was pregnant and ended up making another two dozen when those ran out. 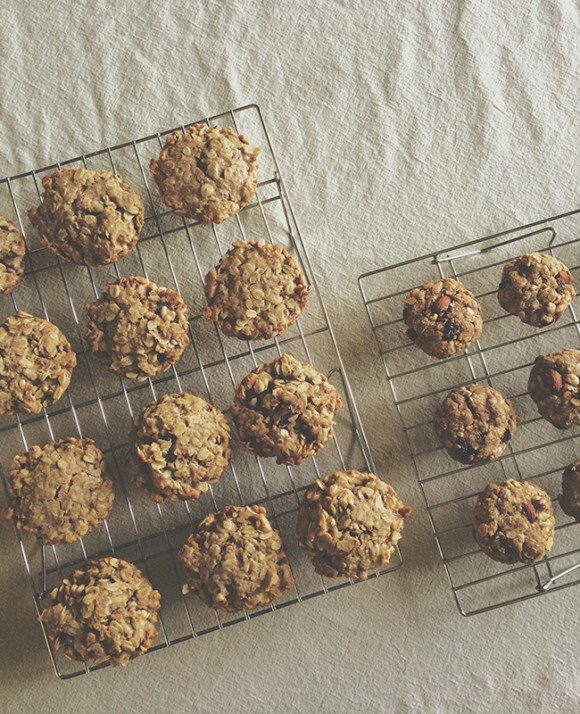 Muesli Snacking Cookies: These just-sweet-enough cookies combine your favorite nut butter (I used peanut butter) with muesli, honey and cinnamon in a surprisingly satisfying little treat. I most often shoved one down before I had to leave the house and knew I would be starving before the next meal. I made and froze a double batch while I was pregnant and gave a little bag of them to a friend who had a baby a couple weeks before me. 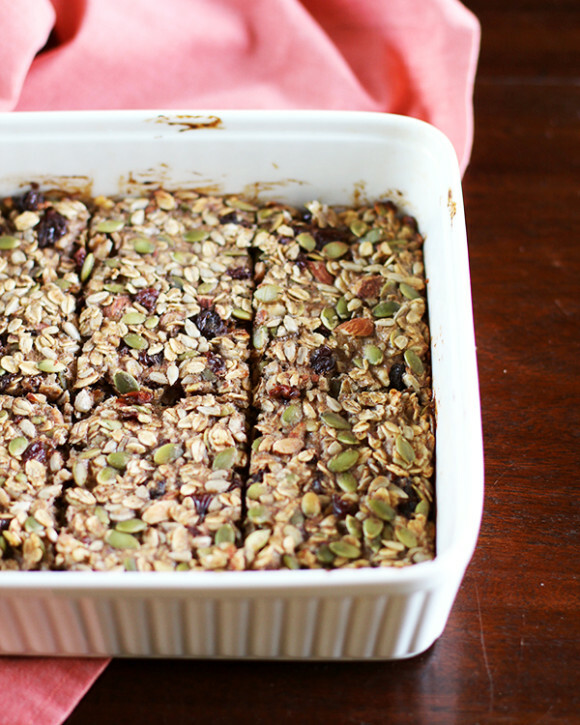 Nut & Seed Banana Oat Bars: An Eat Your Greens classic! I had been depending on these bars to get me through long days at school, so I knew they would be an essential snack once the baby was born. I made and froze a double batch while I was pregnant and probably could have used at least a dozen more. PS did you ever do a recap on how your freezer meals worked out? what froze/defrosted well, etc.? No, but I just talked about it with Faith, so I’ll hopefully be doing a follow-up post in February! This made me smile, Anjali – though the end is in sight for me and nursing- 2.5 months to go (not that I’m counting), I continue to be the hungriest I’ve ever been in my life! I’m always glad for good, healthy snacks for this time! I was so hungry feeding one, I can only imagine how it is with twins, Jess! This is great! I’m expecting this summer and finding it difficult to satiate myself even while pregnant! These are great ideas for before and after birth, definitely pinned. Hi there! These treats sound wonderful! I was wondering how you prefer to thaw these snacks out of the freezer…do you microwave them, let them sit on the counter, or eat them cold? Just curious. Thanks! I let the bars and cookies thaw at room temp — it doesn’t take long and they were usually on-the-go snacks for me, so they sat in my bag for a bit before eating. I microwaved the oatcakes just before eating. Warming them up makes them really fragrant and extra good!